Although the Americans with Disabilities Act (ADA) dictates wheelchair access, some folks go above and beyond when they translate their access plans into actions. They do this for various reasons, be it a professional challenge, personal experience or just a high level of social responsibility. You can see it in the extra touches they add, or in the creative ways they solve access problems. To them, access is more than adding a few grab bars here and there. And the result is a growing inventory of unconventional properties and attractions that are now accessible to wheelchair-users and slow walkers. So here’s a big thumbs up to these doers, for making this world a little more inclusive, one project at a time. Frank Lloyd Wright was an early adapter of accessible design, mostly because of happenstance and a House Beautiful magazine article about his work. When Phyllis Laurent read the article, she contacted Wright and asked him to design an accessible home for her and her husband Kenneth. And although this doesn’t sound like a groundbreaking event, this all happened back in 1952, when wheelchair-users were routinely institutionalized. The Laurents were living at Kenneth’s in-law’s inaccessible house at the time, and the couple desperately needed a place of their own. Wright had never designed an accessible home, but he worked with the Laurents to make it usable for Kenneth. 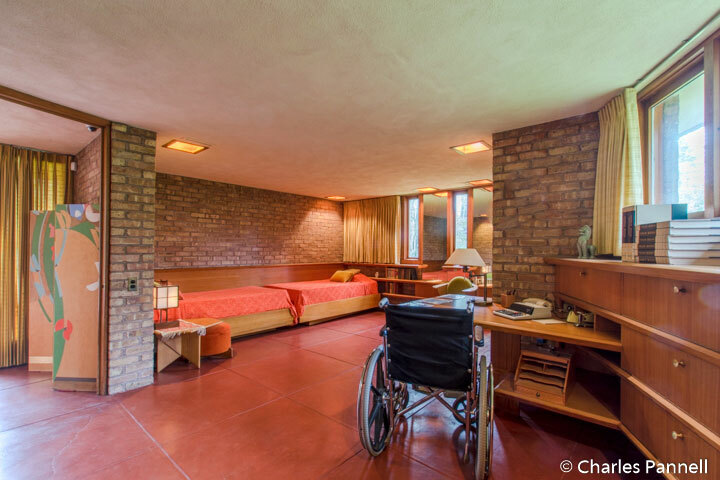 He tweaked the design of his single-story Usonian home model, made it step-free and expanded the open floor plan for better wheelchair access. Wright also added in lowered electrical outlets and doorknobs, and outfitted the bathroom with a low-step shower (remember tubs were standard back then). A government grant for veterans helped the Laurents finance the house, and although it took many years to design and construct, they remained lifelong friends with the architect. Today the Laurent House is open for tours, and because of Wright’s original design, wheelchair-users and slow walkers can also enjoy this historic home tour. 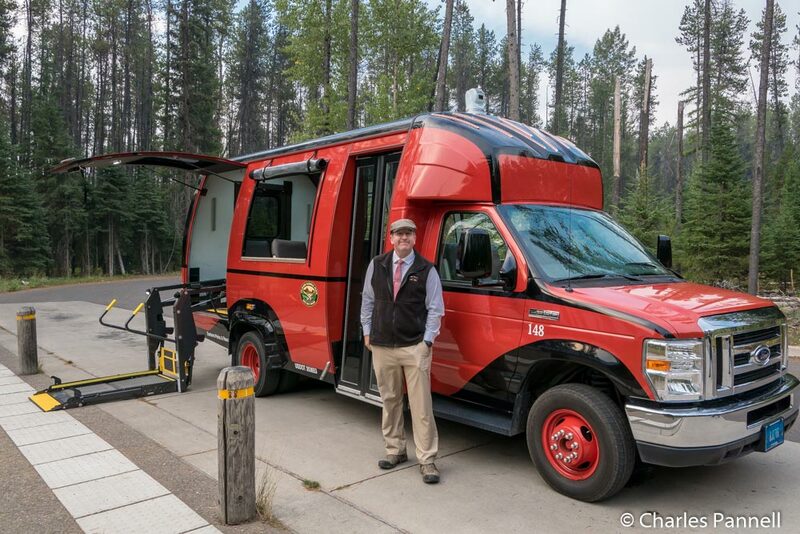 When the Xanterra Travel Collection took over as concessionaire for Glacier National Park in 2015, they knew some changes had to be made to the historic Red Bus Tours. The iconic Red Bus Tours began in 1914, and some of the fleet dated back to the 1930. With two 18-inch high steps, and a narrow bench seat, they were far from accessible. And when Xanterra unveiled their new accessible tour vehicles, jaws literally dropped, as they went above and beyond in both access and comfort. Although Xanterra could have easily added a couple of standard accessible vans to their fleet, instead they purchased two first-class accessible buses. The lift-equipped vehicles can accommodate up to 14 passengers, including two wheelchair-users. Passengers still get the open-air Red Bus experience with the roll-up plastic flaps on the windows; but they can also travel in comfort with air conditioning if they wish. There’s an oxygen tank holder and a power outlet located in the first row of seats, so the tour is doable for folks on supplemental oxygen or a ventilator. And the pièce de résistance is the on-board camera which is controlled by passengers and offers a 360-degree view of the outside. Cool gadgets, luxury and access — the accessible Red Bus Tours have it all. For Connie Hartke, access was a personal issue. Her mother was in a wheelchair during the last year of her life, so she had first-hand experience with access. After Hartke’s Tennessee rental cabins burned down in 2007, it just seemed natural to rebuild them to be accessible. She looked to a wheelchair-user neighbor for advice, but since she had space constraints, she literally sorted things out piece by piece as the construction progressed. For example, when they were working on the interior layout Connie laid boards down to depict the location of the king-sized bed. She then measured the pathway access to see if it was adequate for a wheelchair. Unfortunately it came up short, so she had the builder relocate the bedroom closet into the bathroom. To say she went the extra mile is a huge understatement, and as a result her rebuilt cabins offer access features that aren’t often found in Smoky Mountain rental units. Both cabins feature ramp access, wide doors, good pathway access, and they each include a lowered microwave and accessible cabinets in the kitchen. The smaller Eagles View model has a bathroom with a roll-in shower, and can sleep up to five people; while the large Above The Clouds cabin has two roll-in showers and can accommodate up to 11 guests. 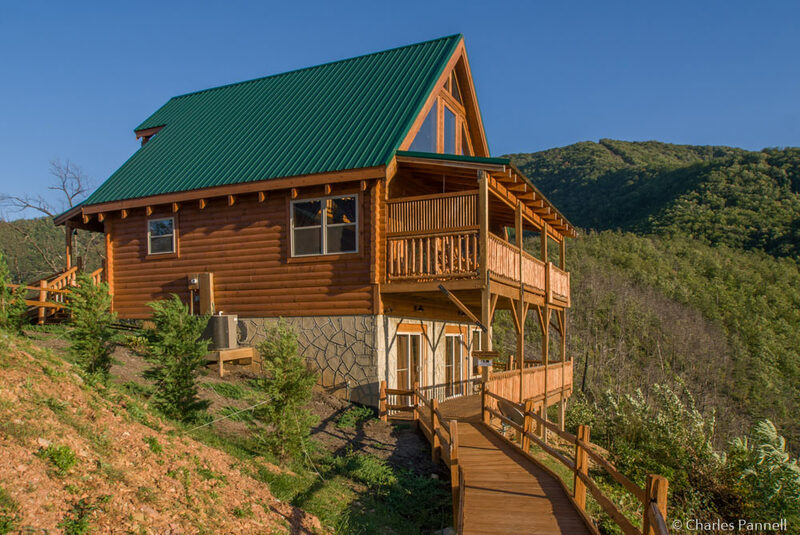 And since both cabins are located on a ridge top, midway between Gatlinburg and Pigeon Forge, the panoramic mountain views are great from either deck. 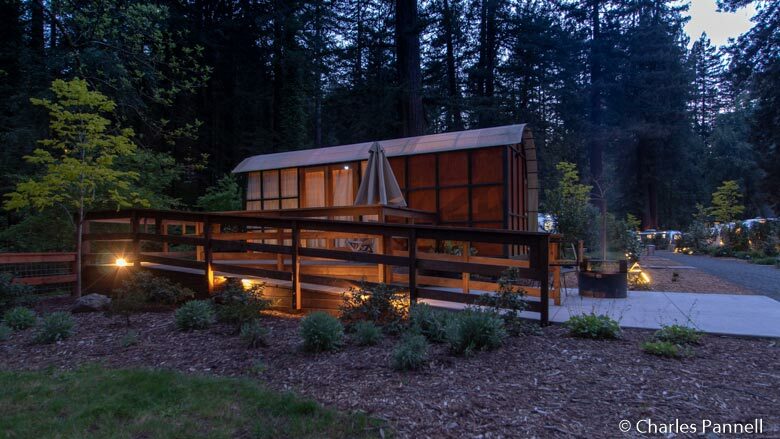 This California-based real estate development company not only offers a new take on upscale camping at Russian River AutoCamp, but also provides and equally luxurious and accessible glamping experience to wheelchair-users and slow walkers. The Russian River AutoCamp concept is pretty simple. You take some custom-built airstream trailers and put them in the middle of a redwood forest, then add in a mid-century style clubhouse, a fire pit and plenty of room to enjoy the great outdoors, and you have the makings of a refreshing new vacation trend. Unfortunately Airstream trailers aren’t very accessible, so Mesa Lane Partners had to find an accessible alternative. And they didn’t just try to shoehorn some access features into a standard trailer — they hired an architect to design an accessible model. Named for the wooden exterior, the custom-built Redwood Suite trailer features a large redwood deck, barrier-free access, an accessible kitchenette and a large bathroom with a roll-in shower. Plus you just can’t beat the interior design, with the bed located in a window-lined alcove with a panoramic view of the surrounding forest. A lot of thought went into the design and execution of the plans, and the good news is, future AutoCamp locations will also sport the same excellent access because of the company’s commitment to inclusion. 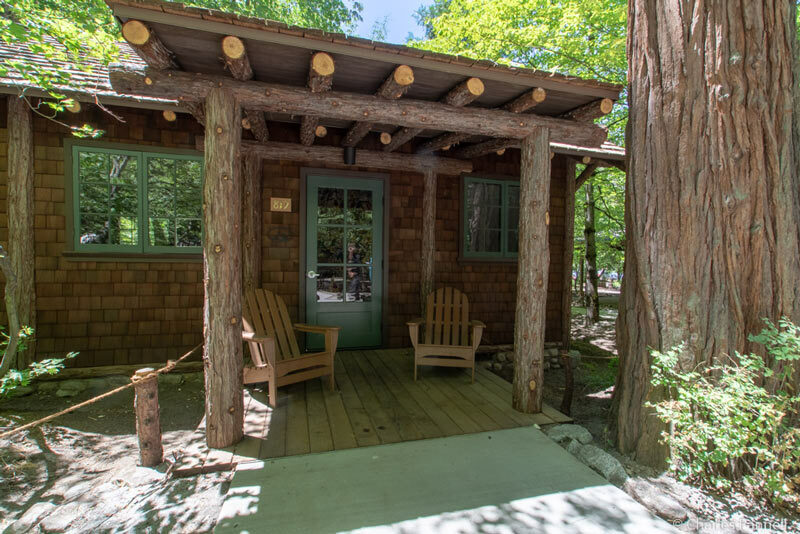 Finally, kudos go out to Yosemite concessionaire, Delaware North Company, for including access upgrades to Mother Curry’s Cabin in their 2018 renovation project. A part of Half Dome Village, this historic cabin was once home to Jennie and David Curry, who first established tent cabins on the site in 1899. Today Half Dome Village offers visitors a growing collection of tent cabins and traditional cabins, including the renovated Curry homestead. Also known as cabin 819, this specialty cabin includes a spacious living area with a large fireplace, and a bedroom with a king-sized bed. There’s good wheelchair access throughout the unit, and the bathroom is equipped with a large roll-in shower. The cabin is also close to the office and dining facilities, and it’s a good choice for a family getaway. It’s one of the nicest cabins in the park, and it’s nice to see that Delaware North went that extra mile to make sure Mother Curry’s former domicile is accessible to all their guests.